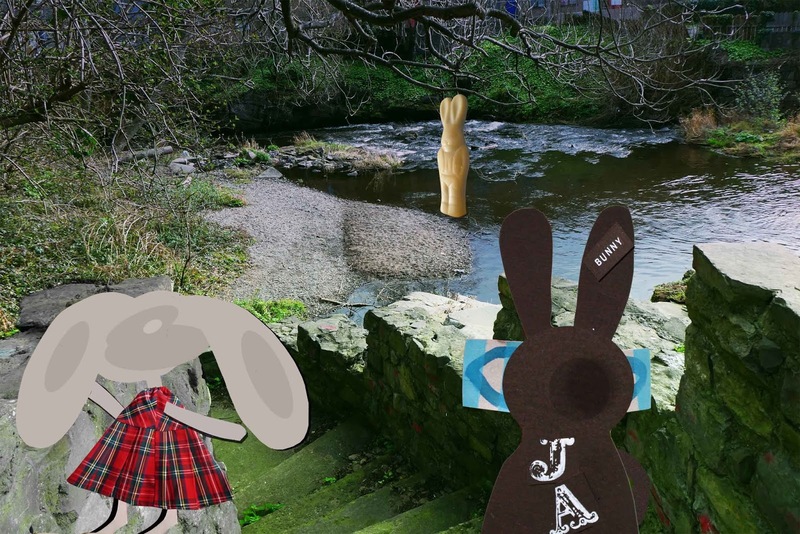 They followed the rabbit along a path to the bottom of the hill, where mossy steps led to a rapidly flowing river. The rabbit hopped onto a small shingled beach. Then he stepped into the water and stood quietly. He nodded downstream to the woods where the river slowed. The Wabbit looked in the direction of the nod but all he could see were trees. The river was blue and noisy. It should have gargled but it roared like a torrent. The rabbit seemed to hover above the water. "Over there," he said. The noise nearly drowned his voice. Lapinette heard him though. "Over where?" The rabbit nodded again. "Over there." "I suppose we'd better look," suggested Lapinette. The Wabbit scowled. "But what if it's a trick?" He didn't sound happy. He didn't much like woods and remembered the occasion where he'd been tracked through the trees by an assassin. Lapinette hopped forward. "He doesn't look very dangerous." It was then that the Wabbit caught a scent of something very familiar. "He's made of chocolate. White chocolate." Lapinette laughed brightly. "Well there you are, what harm can come from a chocolate rabbit?" The Wabbit wrinkled his nose in suspicion, then called across to the chocolate rabbit. "Will you come with us?" "No," said the chocolate rabbit, "You must go alone."